Vedic astrology comes from the mystic land of India and is believed to have been practiced by saints and sages thousands of years ago. It is strongly believed that the science was perceived through the enlightened vision of the sages of those times. This branch of astrology explains with accuracy, the planetary movements and their positions with respect to time and their effects on humans. Early Vedic astrology was only based on the movement of planets with respect to stars, but later on it started including zodiac signs as well. According to Vedic astrology there are 27 constellations made up of 12 zodiac signs, 9 planets and 12 houses with each house and planet representing some aspect of human life. 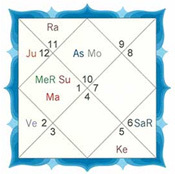 Depending on when a person is born, the 12 signs are distributed among the 12 houses and 9 planets are placed in various houses. This visual representation of the snapshot of the signs and planets is called a horoscope chart. Vedic astrology is nothing but interpreting the meaning of these arrangements as it applies to humans and other entities. Vedic astrology Report is grabbing the attention of people ,because of its proven and irrefutable ability to help individuals gain control over the various problems of life. By correctly interpreting the signs and planets represented in the horoscope chart of an individual, it helps them meet and navigate the obstacles and challenges of life confidently. Your karma or fortune is determined by a predestined cosmic design. You are a soul incarnating in a body at a very specific time and place, and your life is a reflection of the greater whole into which you are born just as flowers bloom at certain times, say during spring time, when all conditions are perfectly congenial. So is the case with our births on this plane. Online Vedic astrology Report is the accurate interpretation of writings found in Vedic scriptures written by enlightened sages thousands of years ago. They help individuals experience intellectual and spiritual awakening. Vedic chart will most likely reflect your real life and your dashas are probably operating the way they should. The Vedic astrologer looks at these planets, signs and house placements in your chart and can "see" your personality, as well as life events and possibilities - both the good and the bad times in your life. The dashas are then used to determine "when" the events will unfold in the life. By remedies it increase the positive aura and dispel the evil obstructions in the lives. Horoscope implicit as Janam Kundali, Janampatri, vedic. A diagram of the heavens, showing the relative position of planets and the signs of the zodiac, for use in calculating births, foretelling events in a person's life. At Astrologypredict.com our aim is to provide you with such accurate reading through our team of deeply experienced and intuitive Vedic Astrologers. Vedic Astrology establishes a relationship between the various phases of human life and planetary movements. Each of the nine planets used in Vedic Astrology is associated with particular qualities including malefic or benefic, strong or weak, and exalted or debilitated. Calculations are made to assess the future movements of the planets and their present positions. While our birth charts are fixed, planets and constellations are constantly in motion. Vedic Astrology system considers what happens when various planets move over the positions of planets or signs in a person's birth chart. A study of such transition is done and some predictions, with the help of a certain amount of foresight, are made. Based on the analysis, a Horoscope is made, which gives detailed information about various phases that are supposed to come in a person's life.